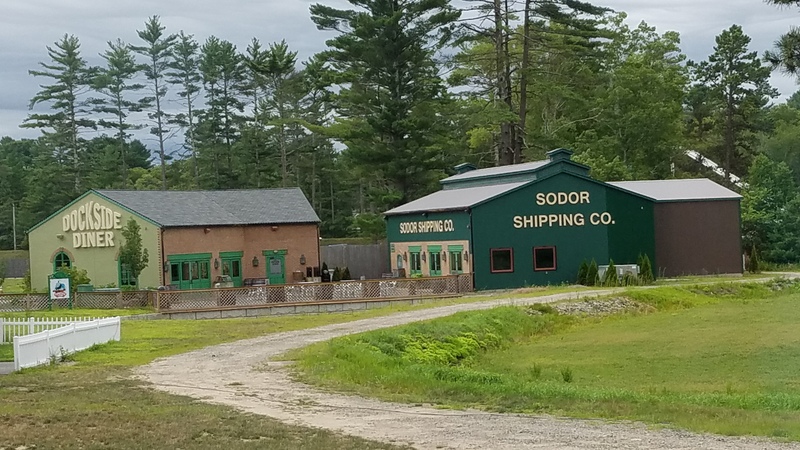 Edaville Family Amusement Park is home to Thomas Land, Dino Land, and Cran Central. It advertises over 90 rides and attractions for family fun. 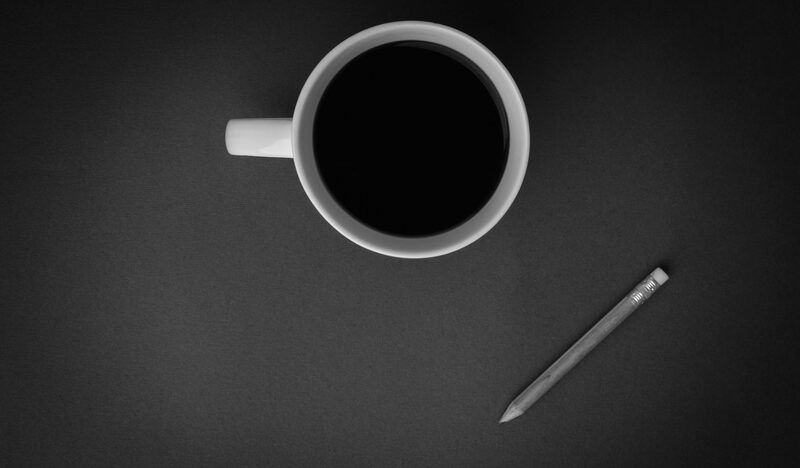 Ticket prices are $37 per adult and $32 per child, which can add up pretty quickly. Luckily, there was a great BOGO Groupon back in February that I took advantage of. Rumor has it that you can also get a discount if you buy your tickets at the gate and show a MA or RI driver’s license. 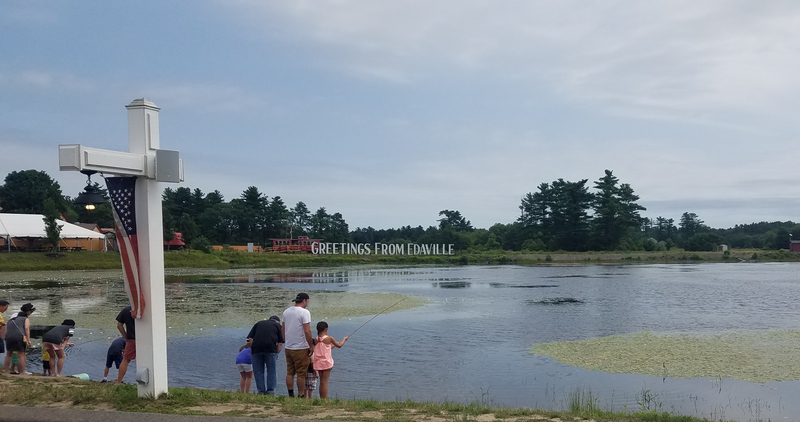 My 3.5-year-old and I went visited Edaville with our friends and their 2.5-year-old daughter on July 23, 2017. It was a cool summer day at only 76°F, which was good because there is very little shade at the park. After you go through the ticket booths there is a picturesque pond where the kids can do some fishing. 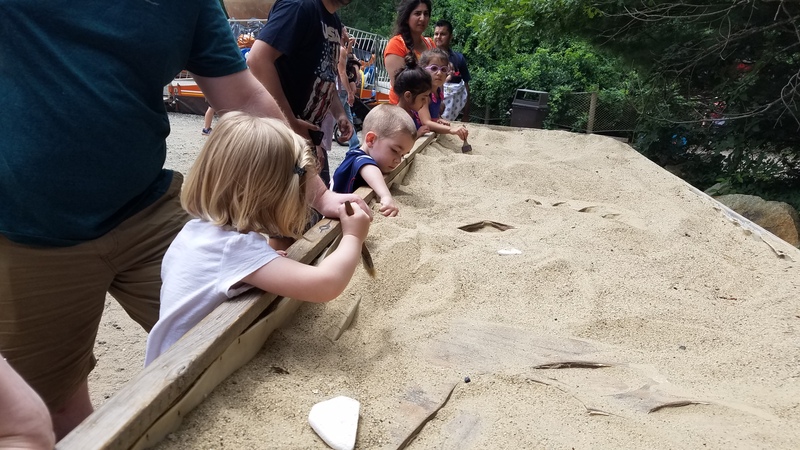 We skipped this because our kiddos wanted to make a beeline for the Thomas the Train ride, which is a great way to start your visit because it gets everyone excited and you can see all the fun things to do around the park. This was our excited face as we waited for our friends to arrive in the parking lot! Fishing at the entrance to Edaville. 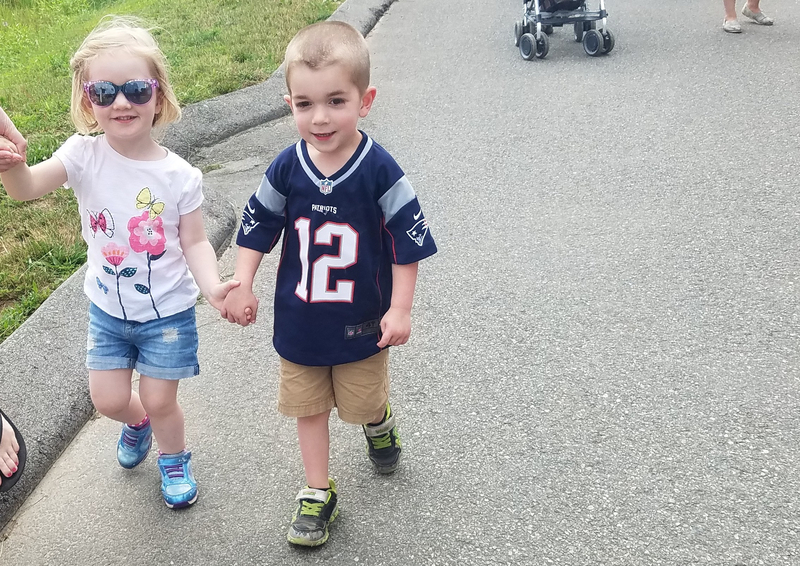 I can’t resist posting this gratuitous shot of a tiny Tom Brady holding hands with a tiny Gisele! 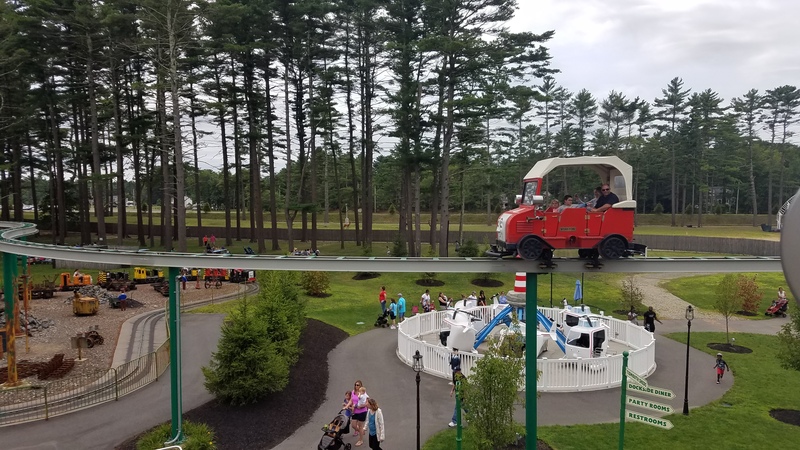 I was a bit skeptical about how much fun the kids would have on the 20-minute train ride because I had read a scathing review of it prior to going to the park. 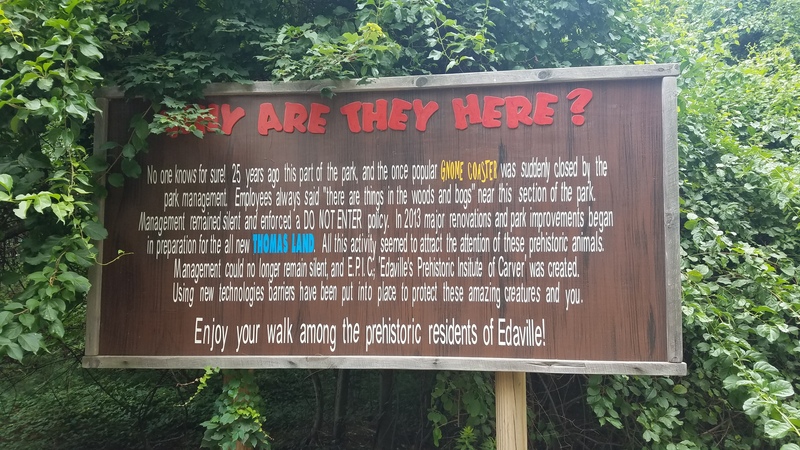 Most of the stuff mentioned in the review is still true, with the exception of the temporary fencing that has been replaced with permanent fencing. 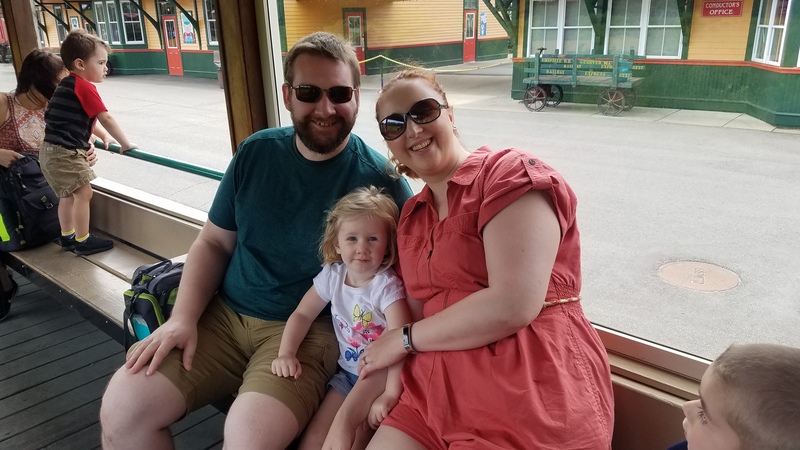 But here’s the thing – the kids loved the train ride despite all the stuff that was mentioned in that review. One of the things the author complained about was being able to see some Christmas decorations through the windows of a storage shed on the train ride. My kid liked the ride even more because of this. “Look, Mommy, it’s Santa in the window!” Use it to your advantage – remind your kid that Santa is always watching so he can keep his Naughty and Nice list up to date! 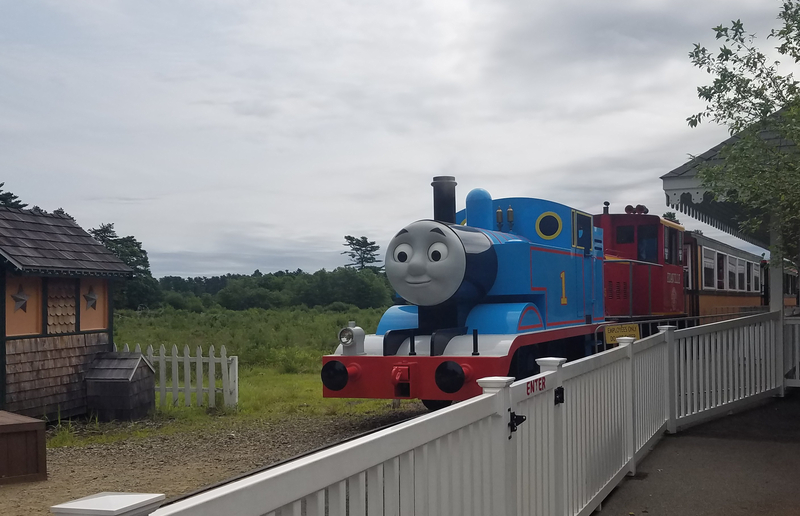 Thomas’ eyes and mouth move, which the tiny tots love. Excitement is in the air as we wait for the train ride to start! 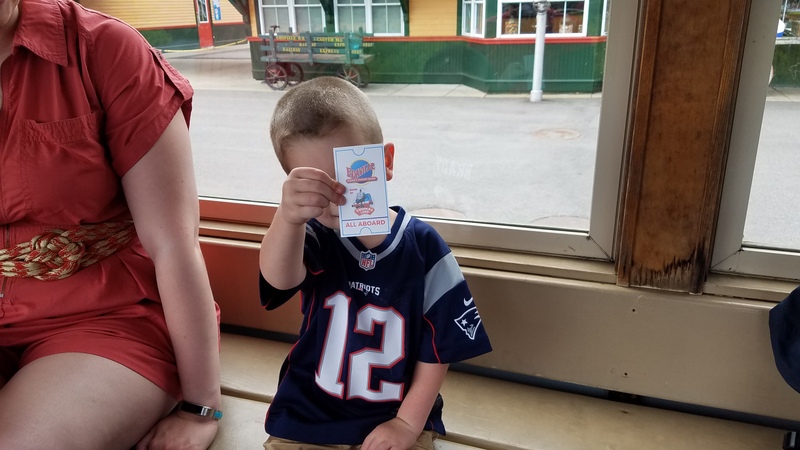 Every kid gets a train ticket! 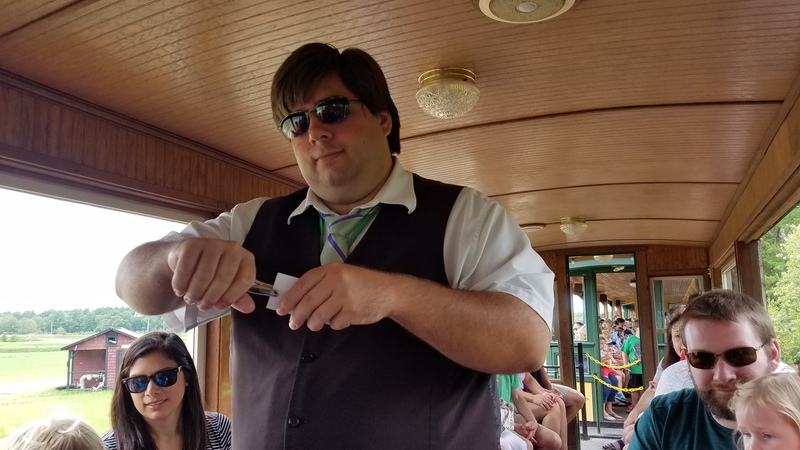 And then the conductor comes around and punches the ticket, just like on a real train! You get the lay of the land on the train ride. There are enclosed train cars and open train cars. Pick an enclosed car if your kiddo likes to stand! 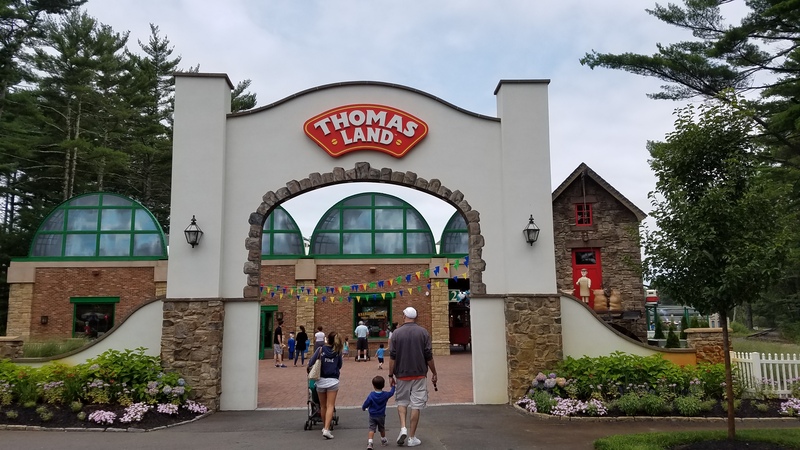 Once the train ride is over, the entrance to Thomas Land is just a short walk away. 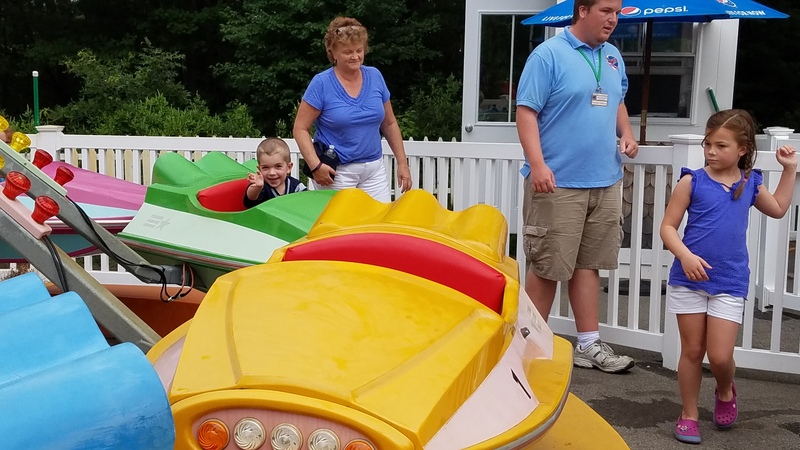 There are several rides that children over 3 are tall enough to go on, but there are a few that they won’t be tall enough for. We ate lunch at Dockside Diner. It was nothing special, but they had a wide variety of foods that satisfied all of our needs. My gluten free needs were met with a salad (my choice of pre-packaged Ken’s dressings), a fruit cup, and a GF brownie. Our friends had pizza, pretzels and hummus, and one of those giant soft pretzels with cheese dipping sauce. Everyone was happy. We chose to eat outside instead of inside the diner because it was a little smoky inside the diner from something that had burned while cooking. 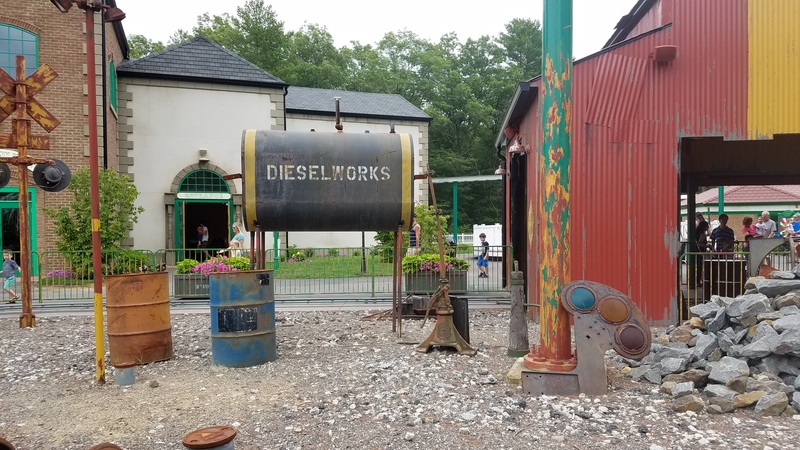 The Diesel Derby ride isn’t very pretty, but that’s because it is staged like a real train yard, which my kiddo loved. 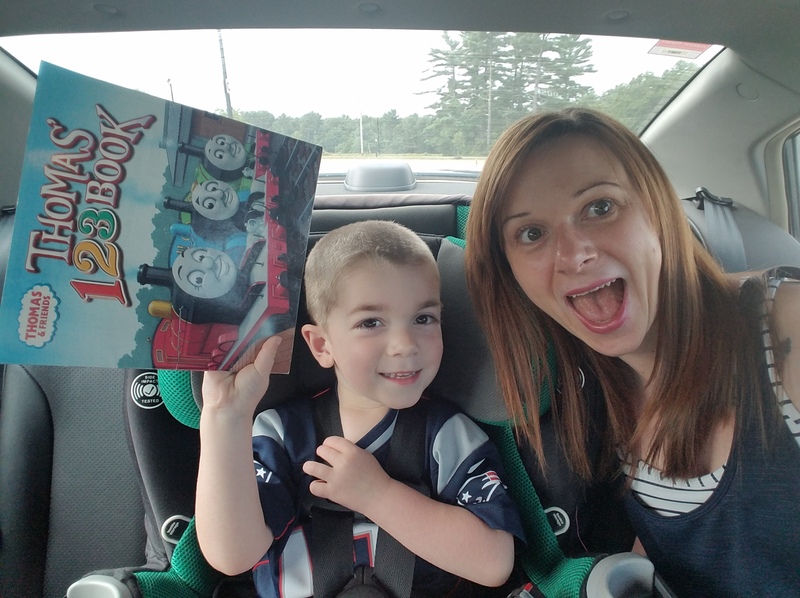 If your child isn’t used to amusement park rides and enjoyed the Thomas the Train ride, this is probably a good ride to start them off on because it is flat and slow and they can sit on your lap so long as you can get the seatbelt over both of you. Winston’s Skyline Express is reminiscent of a monorail and gives you a high-up view of the entire park. 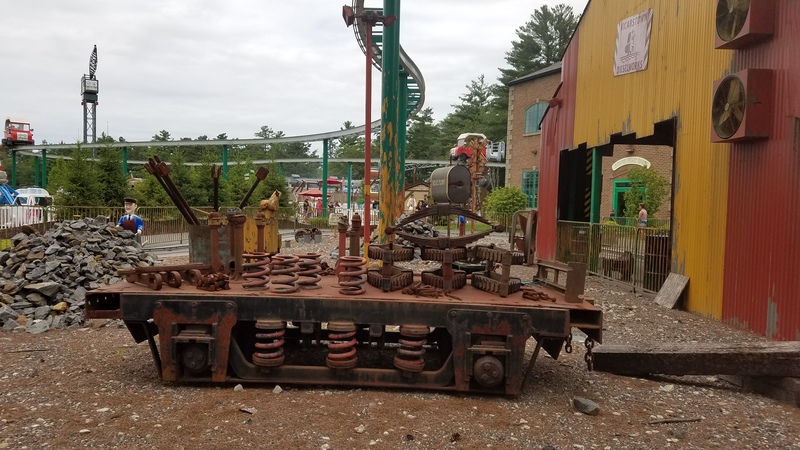 The pictures below give you a good idea of what you see while on the ride, including a shot of Cranky’s Crane Drop and a video of Toby’s Tilting Tracks. 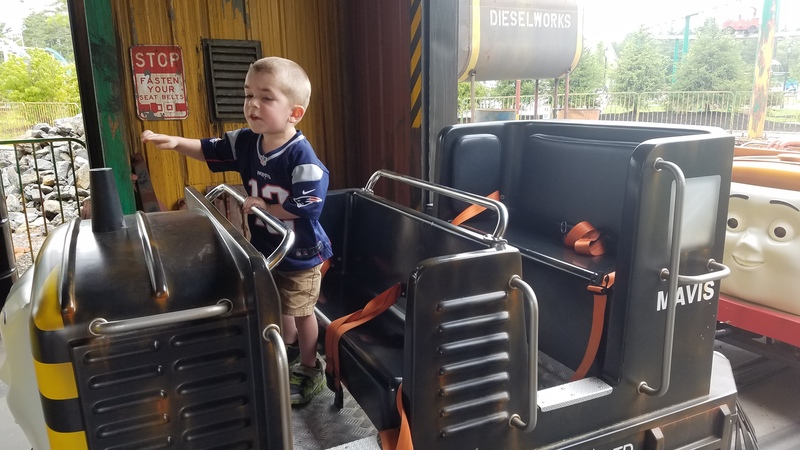 This is another slow ride that is good for beginner amusement park goers because it stays flat and slow but can help your kiddo get used to rides that are up high. There are 3 Winston cars that travel around the track. 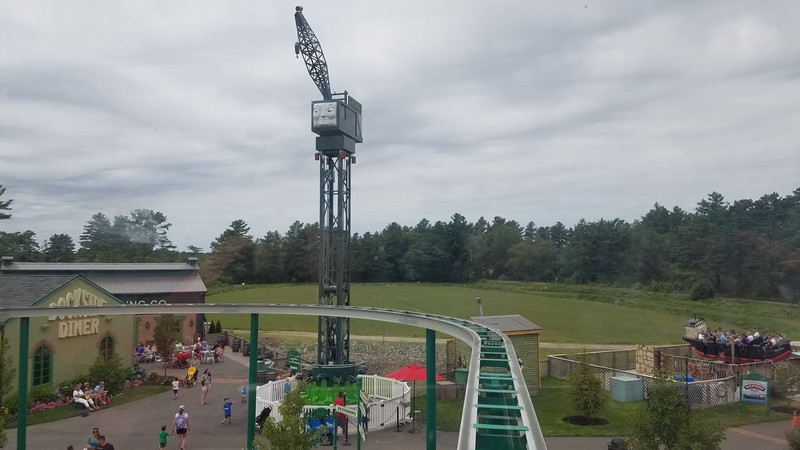 The view of Cranky’s Crane Drop from Winston’s Skyline Express. 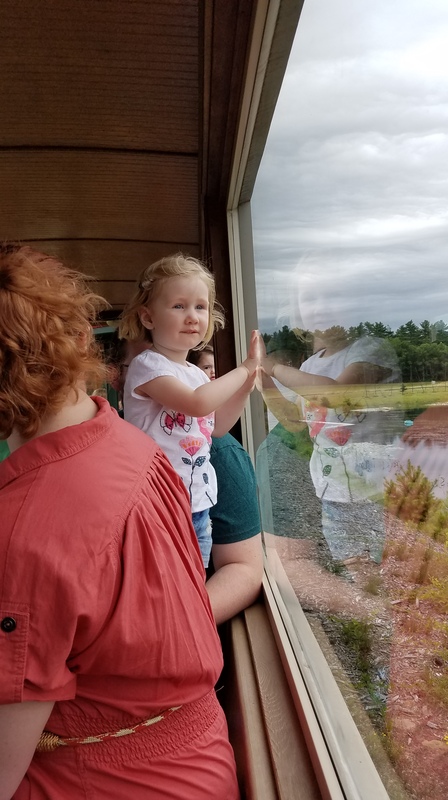 My toddler saw the Rockin’ Bulstrode ride from high atop Winston’s Skyline Express and was begging to go on it. I thought it was going to be too much for him and expected a meltdown aboard the tossing and twirling tugboat, but he loved it! 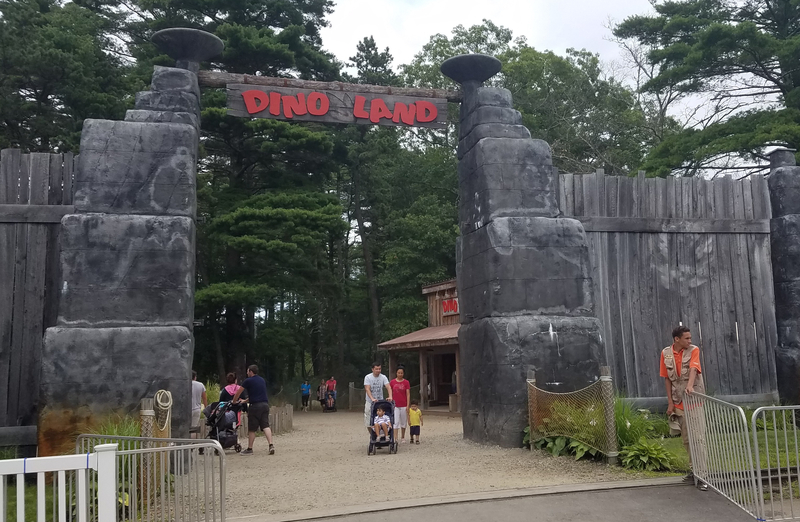 Dino Land is adjacent to Thomas Land. It is basically a large dirt circle that you walk around. 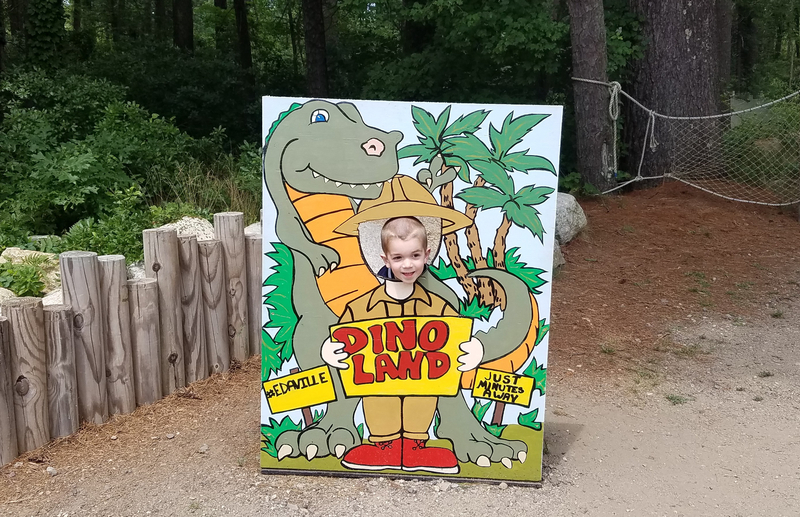 All of the trees make it a shady reprieve from the sun, so we were happy to tour Dino Land a second time per the kids’ request. It’s actually pretty cool to look at because several of the dinosaurs move and make dinosaur sounds. 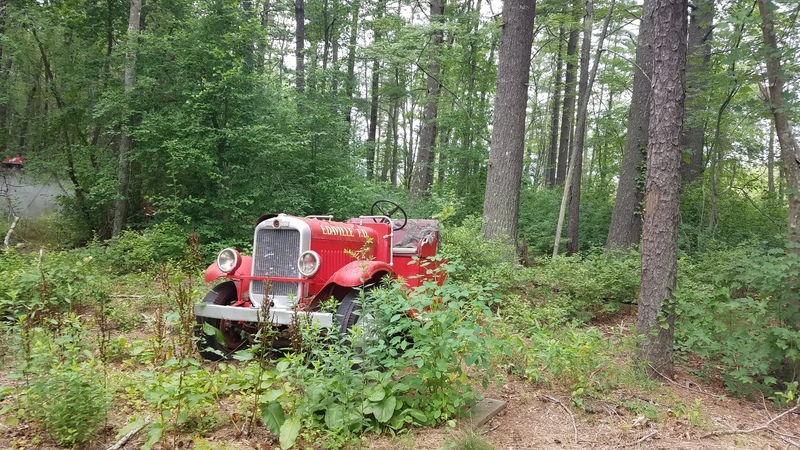 There are some random bits remaining from before this area of the park was renovated into Dino Land, hence the photo of the out-of-place automobile in the middle of the dinosaurs. There is a Big Dig section at the entrance where the kids can use paintbrushes to uncover pretend fossils. There is also one ride here, but we did not get to go on it because the attendant was on a bathroom break. 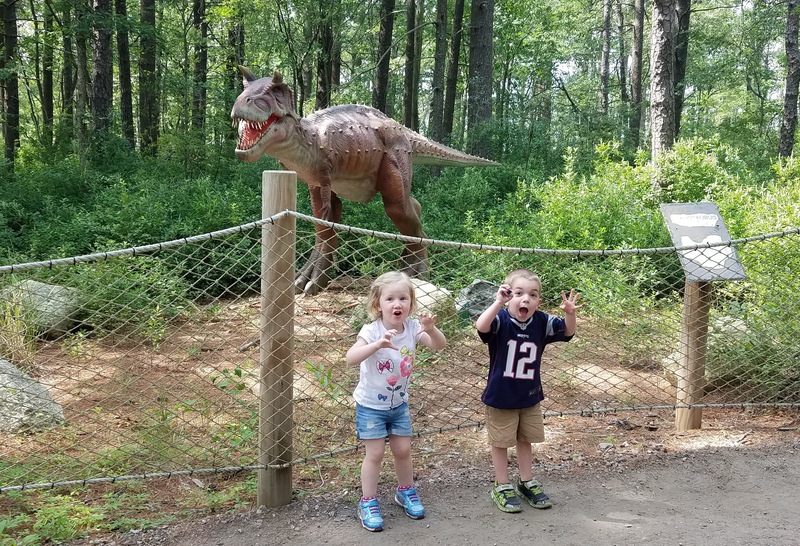 Look at these 2 goofballs roaring like dinosaurs! You can bring your own food and drink and there are plenty of outside picnic tables. 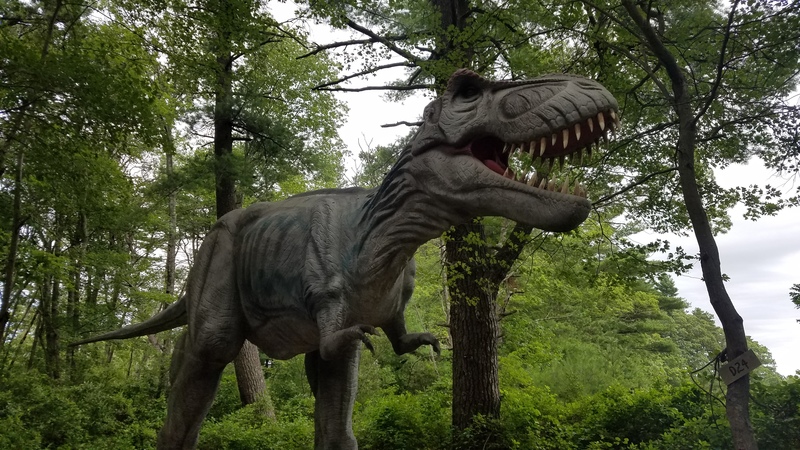 They count each individual dinosaur in Dino Land as a separate attraction, so take the “90 different rides and attractions” statement with a really large grain of salt. This post is inspired by today’s word prompt: Harmonize because these two kiddos harmonized like crazy at Edaville! Hahaha 90 different attractions includes the dinosaurs?! Thanks for he heads up! Sounds like a good way to spend the day! Thanks for the review.